The British Royal Air Force turned 100-years-old in April, and to celebrate it the Air and Space Museum hosted "The Great British Fly-In" featuring some of the most famous planes flown by the RAF in World War II. 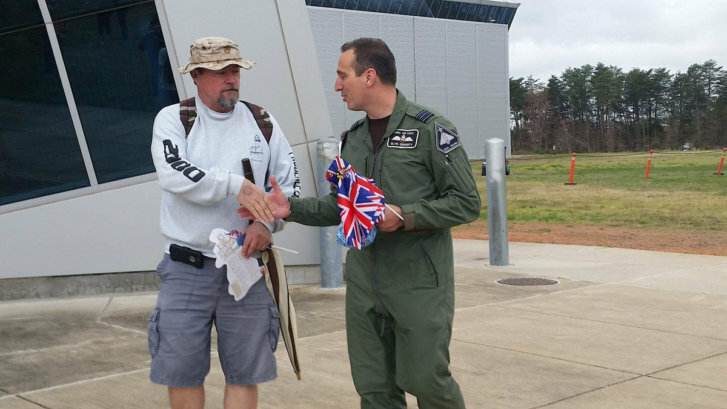 CHANTILLY, Va. — The “Great British Fly-In” was held on the tarmac of the National Air and Space Museum’s Udvar-Hazy Center near Dulles Airport to celebrate the 100th birthday of the British Royal Air Force. Historic aircraft, which the RAF used during World War II, such as the Avro Lancaster, landed outside of Udvar-Hazy Center for the one day event. Guests had the chance to learn about the Royal Air Force up close and personal without having to leave Virginia. Blake was part of the large crowd on the tarmac checking out the aircraft on display, hoping to see the Lancaster and the Spitfire. The Lancaster played a massive part in the bombing campaign of Germany during World War II and the Spitfire played a major role in winning the Battle of Britain. The Lancaster on display was one of only two Lancasters in existence that are still airworthy. Jane Christie was also hoping to see a Spitfire. But neither of the two Spitfires that were expected at the event was able to make it. The historical role of the planes was not lost on Christie. “It helped turn the tide of the war, the Lancasters and the Spitfires,” Christie said. She said the planes mean a lot to people in Britain, where she is from. Stephen Richards, a captain with Royal Air Force said the RAF is the oldest independent air force in the world. Richards said he is extremely proud of the air force and what it had achieved.